Corporal punishment, also referred to as spanking, has remained a divisive and controversial issue for decades. Despite a plethora of credible research detailing the harmful outcomes, not to mention ineffectiveness, of corporal punishment as a form of discipline, it is estimated that 80% of children are subject to this treatment by their parents (Gershoff & Grogan-Kaylor, 2016; UNICEF, 2014). So what gives? The Convention on the Rights of Child, a human rights treaty organized by the UN, requires that governments protect children from “all forms of violence”, explicitly including any type of physical punishment in this mandate (UN General Assembly, 1989). So far, 52 countries have legally abolished corporal punishment and 54 more have committed to doing so (Durrant, Fallon, Lefebvre, & Allan, 2017). in a way that is not degrading, inhuman, or harmful. These seemingly arbitrary guidelines are in place to protect both “persons in authority” (i.e., parents) as well as children by creating a legally acceptable form of non-abusive physical punishment. In other words, the Supreme Court surmised that any physical punishment falling within these limits is considered harmless and without risk to the child (Durrant et al., 2017). Durrant and colleague’s 2017 study challenged the court’s guidelines and indicated that if these limits are indeed non-abusive and reflect the current state of child welfare in Canada, most confirmed cases of physical abuse should exceed the designated parameters (Durrant et al., 2017). However, this was not the case. They found that 28.4% of substantiated physical abuse cases in Ontario did not surpass any of the seven limits, suggesting a serious discord between the child welfare system and the criminal justice system regarding their definition of maltreatment (Durrant et al., 2017). Parents are therefore provided with conflicting messages about how to discipline their children and may end up feeling protected by one system and condemned by another. This topic garnered national attention in 2014 when Adrian Peterson, running back for the Minnesota Vikings, was charged with child abuse for repeatedly striking his 4-year-old son with a switch. The public response demonstrated the divergent views that people have regarding corporal punishment, with many coming to Peterson’s defense and identifying with his good intentions, while others demanded that he be held accountable for his actions. In the end, Peterson plead no contest to a reckless assault charge and was suspended for the remainder of the 2014 season. The general acceptance of physical punishment as a disciplinary technique is thought to originate from writings in the Bible, where children were commonly regarded as property of their parents (Belsky, 1980). Many Christians believe that spanking helps children become absolved of their guilt, making physical punishment an “act of love” (Jones, 2014). The approval and support for corporal punishment is often perpetuated by way of intergenerational transmission. Many advocates who were themselves spanked as children use this anecdotal experience as “evidence” of its success (Jones, 2014). You often hear people argue that they were spanked and turned out “just fine”, which some experts suppose may be a way of using selective memory to justify their current parenting practices (Gershoff & Grogan-Kaylor, 2016). This support is communicated through social media and memes, like the one pictured below, as well as popular quotes like “Spare the rod, spoil the child”. It is clear that, generally speaking, spanking and corporal punishment are employed by parents to discipline their children for bad behaviour. This is especially true for short-term compliance. Although some research points to minimal evidence of physical punishment being effective in the immediate future through conditioning effects and fear, it only works when the parent is actually present (America Psychological Association, APA, 2002). It does not deter children’s future misbehaviour, and therefore is not effective in the long term (APA, 2002). Children do not have the developmental capacity to understand the connection between physical punishment and unwanted behaviour. Furthermore, there are several other ways to discipline children that are less punitive and based in evidence, like withholding privileges or time-outs. There is a clear correlation between spanking and a number of detrimental cognitive, social, academic, and mental/physical health outcomes (Committee on Psychosocial Aspects of Child and Family Health, 1998; Gershoff & Grogan-Kaylor, 2016; MacKenzie Nicklas, Waldfogel, & Brooks-Gunn, 2013; Taylor, Manganello, Lee, & Rice, 2010). Dr. Elizabeth Gershoff, a leading researcher on physical punishment, found that spanking was associated with more aggression, anti-social behaviour, externalizing and internalizing problems, mental health issues, and negative relationships with parents, as well as decreased cognitive ability and lower self-esteem (Gershoff & Grogan-Kaylor, 2016). It was also shown that these negative outcomes are observed even when a restricted or “soft” definition of spanking is used (Gershoff & Grogan-Kaylor, 2016). In fact, there were few differences found between spanking and physical abuse, with them both indicating an association with the same harmful outcomes at almost the same strength (Gershoff & Grogan-Kaylor, 2016). That being said, several studies have shown that the severity and frequency of corporal punishment makes a difference, with spanking that occurs more harshly or more often linked to worse child outcomes (APA, 2002; Cuddy & Reeves, 2014). Child aggression is a commonly reported outcome of physical punishment, and for good reason. Think about it: children cannot possibly distinguish the difference between hitting for discipline or hitting for abuse. At the end of the day, a hit is a hit, and since most parents are teaching their kids not to hurt others, it reinforces a “do as I say, not as I do” orientation. It’s not difficult to see how this could be very confusing for children. Social learning theory explains that spanked children come to associate aggression and violence with power over others, and this often manifests itself in bullying behaviour (Taylor et al., 2010). Children also begin to see violence as a coping strategy by observing their parents’ response to stressful situations. Like most social work research, it is impossible to determine whether corporal punishment causes these adverse outcomes (APA, 2002). In order to do so, families would have to be randomly assigned to either use physical punishment on their children or not use it, which would be unethical and hazardous (Taylor et al., 2010). Furthermore, the inability to control all possible factors linked to corporal punishment or child outcomes may lead to confounding results (Cuddy & Reeves, 2014). Therefore, researchers are only able to make claims about the association or correlation between spanking and the aforementioned issues. This also means that not all children who are spanked will become aggressive or face mental health issues. It is a complex interaction of situational variables that determine a child’s future. 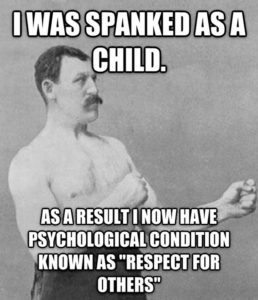 Although many argue that any physical punishment is, by definition, physical abuse, there is evidence that discipline via spanking increases the likelihood of maltreatment in the future. Experts argue that spanking is on a continuum of violence that can escalate into physical abuse (Straus, 2001; Gershoff & Grogan-Kaylor, 2016). At least 75% of physical abuse cases began as disciplinary responses intended to correct the child’s behaviour (Durrant et al., 2006; Gershoff & Grogan-Kaylor, 2016). Some speculate that spanking’s lack of effectiveness over time may be part of the reason that parents use increasingly harsh and intense physical punishment to achieve the same result (Jones, 2014). In addition, corporal punishment is often reactive, rather than planned in advance, which makes it less likely that the parent will be calm when dispensing it (Jones, 2014). The vast majority of parents who use physical punishment do not do so with an intention to harm their child. What is noted in the literature, however, is a belief among physically abusive parents that they have a “right” to engage in physical discipline and that their behaviour is “justified” (Dietrich, Berkowitz, Kadushin, & McGloin, 1990; Durrant et al., 2017). These parents are also more likely to rely on physical punishment to control their children’s behaviour and do not modify their discipline strategy in response to different forms of child misbehaviour (Belsky, 1993; Trickett & Kuczynski, 1986). A recent Ontario study found that families who regularly employ spanking were almost 6 times more likely to have their physical abuse cases substantiated than those in which spanking was not typical (Durrant et al., 2017). A US study determined that every single time a child is spanked, their odds of receiving severe violence (like punching or burning) increase by 3% (Zolotor, Theodore, Chang, Berkoff, & Runyan, 2008). If an object is used, those odds increase by 9% (Zolotor et al., 2008). Efforts to define boundaries of non-abusive physical discipline are fraught with issues, as indicated above. When over one-quarter of substantiated physical abuse cases fall within the current definition, it becomes apparent that the abolition of physical punishment entirely is necessary for preventing abuse and protecting children (Durrant et al., 2017). As Gershoff stated, “until researchers, clinicians, and parents can definitively demonstrate the presence of positive effects of corporal punishment, including effectiveness in halting future misbehavior, not just the absence of negative effects, we as psychologists cannot responsibly recommend its use” (APA, 2002). American Psychological Association. (2002). Is corporal punishment an effective means of discipline? Retrieved from http://www.apa.org/news/press/releases/2002/06/spanking.aspx. Belsky, J. (1980). Child maltreatment: An ecological integration. American Psychologist, 35(4), 320-335. Belsky, J. (1993). Etiology of child maltreatment: A development-ecological analysis. Psychological Bulletin, 114(3), 413-434. Committee on Psychosocial Aspects of Child and Family Health. (1998). Guidance for effective discipline. Pediatrics, 101(4), 723-728. Cuddy, E., & Reeves, R. V. (2014). Hitting kids: American parenting and physical punishment. Brookings. Retrieved from https://www.brookings.edu/research/hitting-kids-american-parenting-and-physical-punishment/. Dietrich, D., Berkowitz, L., Kadushin, A., & McGloin, J. (1990). Some factors influencing abusers’ justification of their child abuse. Child Abuse & Neglect, 14, 337-345. Durrant, J. E., Fallon, B., Lefebvre, R. & Allan, K. (2017). Defining reasonable force: Does it advance child protection? Child Abuse & Neglect, 71, 32-43. Durrant, J., Trocmé, N., Fallon, B., Milne, C., Black, T., & Knoke, D. (2006). Punitive violence against children in Canada. CECW Information Sheet #41E. Toronto, Canada: University of Toronto, Faculty of Social Work. Retrieved from www.cecw-cepb.ca/DocsEng/PunitiveViolence41E.pdf. Gershoff, E. T., & Grogan-Kaylor, A. (2016). Spanking and child outcomes: Old controversies and new meta-analyses. Journal of Family Psychology, 30, 453-469. Jones, C. (2014). Corporal punishment in the home: Parenting tool or parenting fail…. Science-Based Medicine. Retrieved from https://sciencebasedmedicine.org/corporal-punishment-in-the-home-parenting-tool-or-parenting-fail/. MacKenzie, M. J., Nicklas, E., Waldfogel, J., & Brooks-Gunn, J. (2013). Spanking and child development across the first decade of life. Pediatrics, 132(5), 1118-1125. Straus, M. A. (2001). Beating the devil out of them: Corporal punishment in American families (2nd ed.). Piscataway, NJ: Transaction Publishers. Taylor, C. A., Manganello, J. A., Lee, S. J., & Rice, J. C. (2010). Mothers’ spanking of 3-year-old children and subsequent risk of children’s aggressive behavior. Pediatrics, 125(5), 1057-1065. Trickett, P. K., & Kuczynski, L. (1986). Children’s misbehaviors and parental discipline strategies in abusive and nonabusive families. Developmental Psychology, 22, 115-123. UN General Assembly. (1989). Convention on the Rights of the Child. United Nations, Treaty Series, vol. 1577. Zolotor, A. J., Theodore, A. D., Chang, J. J., Berkoff, M. C., & Runyan, D. K. (2008) Speak softly – and forget the stick. Corporal punishment and child physical abuse. American Journal of Preventive Medicine, 35, 364-369.